The current security situation in Iraq is likely to worsen if the abuses of civilians by Shia militias within the PMF are not officially recognised and appropriately responded to. 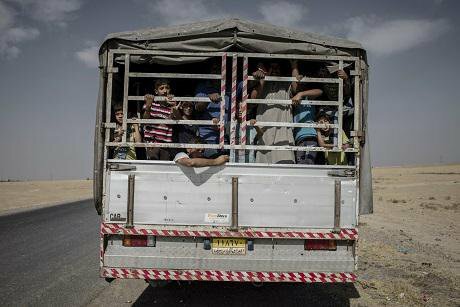 ID Iraqis on their way back to their hometown. 4 October 2016. Cengiz Yar/Press Association Images. All rights reserved.The PMF is made up primarily of Shia Muslim groups, the strongest and most powerful of which are backed and controlled by Iran. In April 2015, the PMF was formally put under the command of Prime Minister Haider al-Abadi. Toward the end of 2015 and throughout the spring of 2016, I was on the ground in Erbil, Iraq, speaking to internally displaced persons (IDPs) from different parts of the country. One group came from a city that had been freed by the Iraqi army one year earlier. These IDPs told me their stories; stories of harassment, kidnapping and killing of Sunni men and boys by Shia militias. Their reports stated that the reason these men and boys were targeted for abuse was due to their Sunni surnames and that the atrocities primarily occurred when IDPs were leaving from or returning to their home cities. In the war against the so called “Islamic State” (IS), the first reports of harassment, killings, and houses blown up and burned down by Shia militias appeared in early 2015 and then again when the city of Tikrit was regained from IS in March and April of 2015. Since retaking Tikrit, reports of crimes committed by Shia militias have steadily increased in various parts of Iraq and have not only included cases during or directly after an area’s takeover. Also in districts such as Muqdadiya in the Diyala Governorate, which has been under government control since January of 2015, reports of abuses by Shia militias have continued throughout 2015 and into 2016. Due to these and many other such documented abuses, Shia militias were side-lined in the operations to retake Ramadi in December 2015 and included only in combat operations outside the city during the Fallujah operation in May and June of this year. Nevertheless, accounts of enforced disappearances, mutilation of corpses, as well as executions attributed to the Shia militias appeared during and after the operation of retaking Fallujah. Moreover, crimes by these militias are no longer only committed on civilians following takeover or upon return to cities. Acts committed by Shia militias are taking new shapes; as Iraqi news websites reported on 10 July, Shia militias had burned Sunni citizens in retaliation for the deadliest explosions that hit Baghdad since 2003, which were claimed by IS and had killed more than 300 civilians. It is unlikely that coalition forces are not aware of these acts by the Iran-backed Shia militias. Human Rights Watch and Amnesty International have identified the atrocities committed by Shia militias as war crimes. But when asked whether Iran is more helpful or harmful in this conflict, US Secretary of State John Kerry stated that “Iran in Iraq has been in certain ways helpful”, thereby ignoring the harmful effects of Iranian involvement in Iraq, much of it through the Shia militias. Through my work on the ground in Iraq, I have identified two immediate consequences for civilians of Iraq that should not be ignored: firstly, as one person I spoke to said: “residents in Daesh [synonym for IS] held cities would prefer to stay in these cities rather than leaving, fearing for their lives when walking into the hands of Shia militias”. In June the former governor of Mosul warned of exactly this, which can lead to increased numbers of civilian deaths when operations such as Mosul take place. In other words, having such a violent and abusive ‘opposition’, makes IS look more worthy of the civilians' loyalty. Secondly, if Shia militias remain in the newly liberated cities as they currently are in Fallujah, where they have declared they will remain for an undefined period of time, the large majority of displaced Sunnis may not feel safe to return. For a city such as Fallujah this could mean that up to 300,000 residents will choose not to return and instead remain in their areas of displacement, where authorities and relief organisations are often overwhelmed. The sole attention all over the world and in the US-led coalition in particular appears to be to combat IS to decrease their activity and potential to commit terrorist acts. This focus might defeat the terrorist group in the short-term. However, continued impunity for Shia committed war crimes while international coalition members, and in particular the US, look the other way, will have mainly one outcome. It will lead to a situation in Iraq in which these Shia militias, formally under the command of the Prime Minister, will become a greater threat than IS to the stability of the country. In the medium and long-terms it will divide Iraq and lead to further conflict and tensions in the region and beyond. As a party to the 1949 Geneva Conventions and the 1977 Additional Protocol I, Iraq is required to enact criminal legislation to prosecute those responsible. As such, various recommendations, on both the country and international level, should be reiterated. As stated by Human Rights Watch, the Iraqi government needs to establish effective command and control over the PMF and other pro-government militias without delay.Those militias that resist compliance need to be disbanded. Moreover, the government needs to ensure that militia members involved in violations of humanitarian law and international human rights are prosecuted. On the international level, the US government “needs to fully acknowledge and address the widespread, ongoing abuses by Iraqi government forces and the near complete absence of transparent investigations or any investigations at all”. While this is particularly true for the US which is leading the coalition against IS, it should equally apply to all other coalition governments. Without official recognition and condemnation of these acts, instability in Iraq will continue, as confirmed by the most recent reports of revenge killings following the Baghdad bombing. If appropriate actions are not taken in response to these crimes, I am afraid that the stories I was told by IDPs in Iraq will be just the beginning of their struggle.